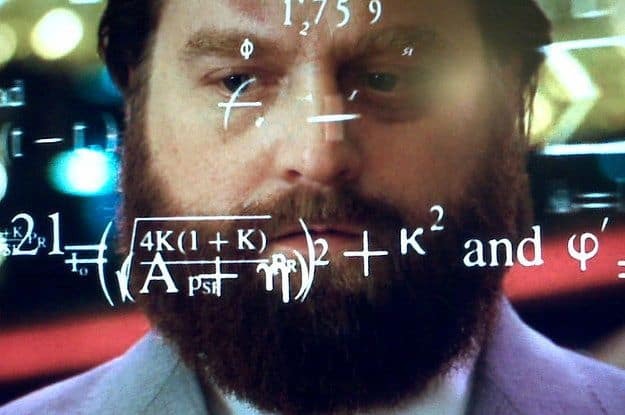 When​ you​ first start budgeting for your vegan shopping, you’ll probably ask yourself this question dozens of times. Watching your friends buy cheap frozen pizza or grab deals off the dollar menu while you’re burning through your weekly food budget is enough to make you throw your hands up in despair. ​And if that’s not enough, there’s trying to work out what is both vegan and affordable from the food labels at the supermarket​..
And then you get to the counter to pay for it and have a heart attack at the price. As if going vegan wasn’t hard enough, you now have to ​pay for it – literally. 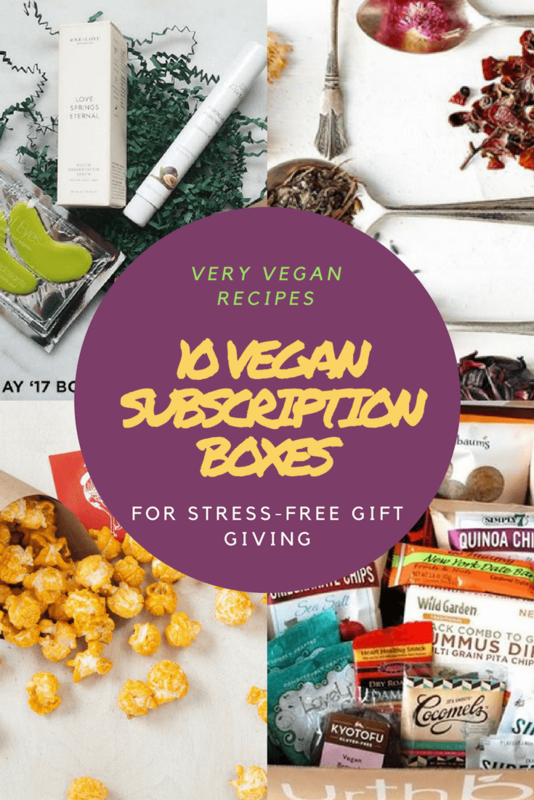 ​Well, I am here to tell you that with a little bit of strategy and some know-how, eating healthy vegan foods on a budget is actually much easier than you might think. It takes a bit of planning and thinking differently, but it ​is more than possible. It is even possible (drum roll) to eat for as ​little as $25 a week. I put together a meal plan for my niece going to college​. At first she said being vegan was way to expensive to ‘keep up’ at college. So began the challenge… ​You can see an example from the grocery list and example recipes below. 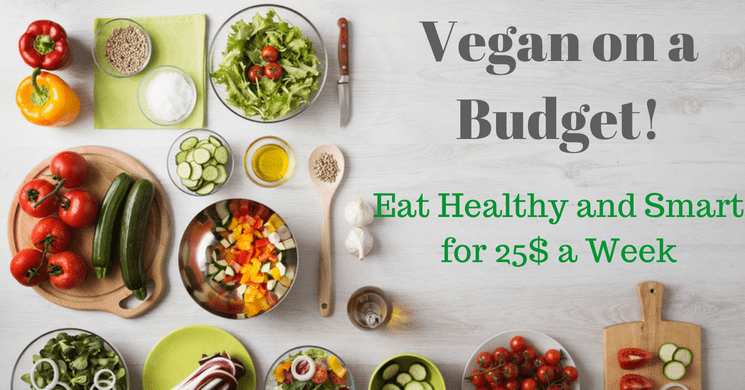 ​Even if you don’t plan on ​aiming for a budget that low, there are lots of easy ways to rope in the ​food spending for a vegan diet while still eating healthy and eating well if you follow this guide. 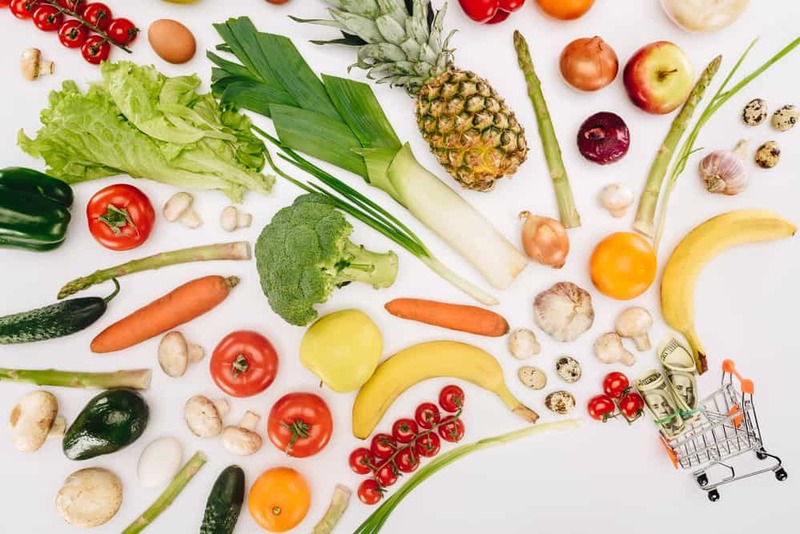 If you’re not careful about the types of foods you buy and how and where you shop for them, it’s easy for your grocery bills to quickly skyrocket. These 12 tips will ​help you plan like a pro​..
Planning backwards, also known as reverse meal planning, can be an excellent way to save money on your monthly grocery bill. Basically, you go to the store, only buy things that are on sale, then come home and plan out your shopping list based on the extra items you will need to add to what you already have to make complete meals. The key to success here lies in thinking in terms of categories (fruits, vegetables, grains, and proteins) rather than recipes. Pay attention to items that are going out of season and look for sales in each category. As long as you get something in each category, there’s a meal waiting to happen. There are pros and cons to this method. If you’re not careful, you may end up buying things you won’t actually use or find that the additional ingredients you need to complete the meal cost more than you expected. Also, once you plan your meals, you’ll also have to go back to the grocery store, which can be a major drawback for some. You can do a modified version of this system by reviewing grocery store flyers ahead of time and planning your meals around the listed sales. If you want to save the most money possible, however, the extra trip to the store means gives you a better opportunity to find rock-bottom deals that may not have been advertised. When it comes to dry foods like beans, rice, and pasta, buying bulk can save you a ton of money. In general, the larger the package you purchase, the less expensive the per-serving cost will be. It’s critically important, however, that you plan ahead to ensure you know how to properly store your foods. The last thing you want is for your ingredients to go stale or to end up with a pantry full of bugs. If they are dry, they need to stay dry and stay sealed. Don’t leave ingredients like sugar and flour in their original packaging but place into a sealed container, preferably something see through so you know when you are running low. Store your canned foods or those that are shelf-stable somewhere cool and dry. Don’t put them over the sink or a stove where moisture or heat will affect them. 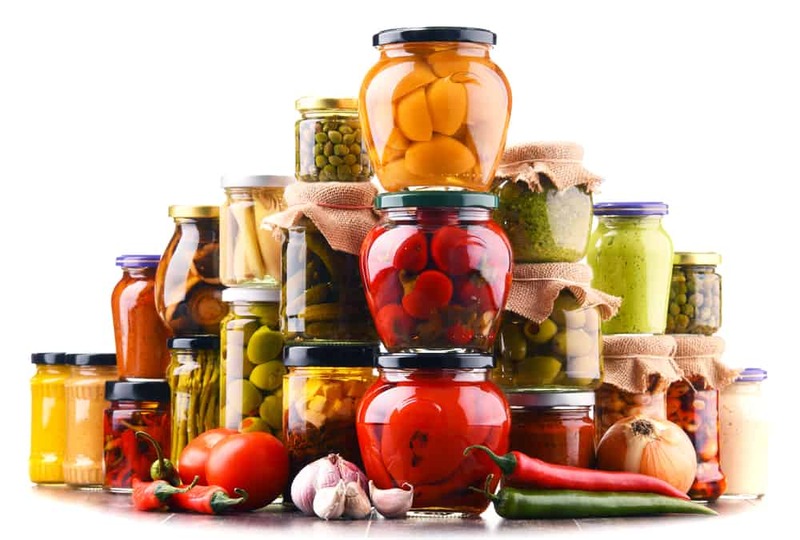 If possible, opt for glass containers. OK, you can get good affordable containers that are also quality and I know we are talking budgeting here, but this is not only good for the environment but a great longer term investment. This initial expense will quickly pay for itself in the form of product freshness and peace of mind. Asian supermarkets may seem a bit intimidating at first because of the sheer variety, but they’re actually a vegan grocery shopper’s paradise. You can find many flavorful ingredients like soy, tofu, coconut milk, and all kinds of spices for a fraction of what you’ll pay at a traditional grocery store. Many ethnic markets also have a bulk foods section where you can either stock up on staples or measure out just enough of a certain ingredient to make that exotic dish you’ve been dying to try. In many cases, the fresh vegetables and herbs are also far less expensive. If you’ve found a sale on something that freezes well, go ahead and stock up while you’re there. Fruits and vegetables are a major staple in vegan diets. Since they’re also perishable, if you don’t know what you’re doing they can also be one of your biggest budget-killers. 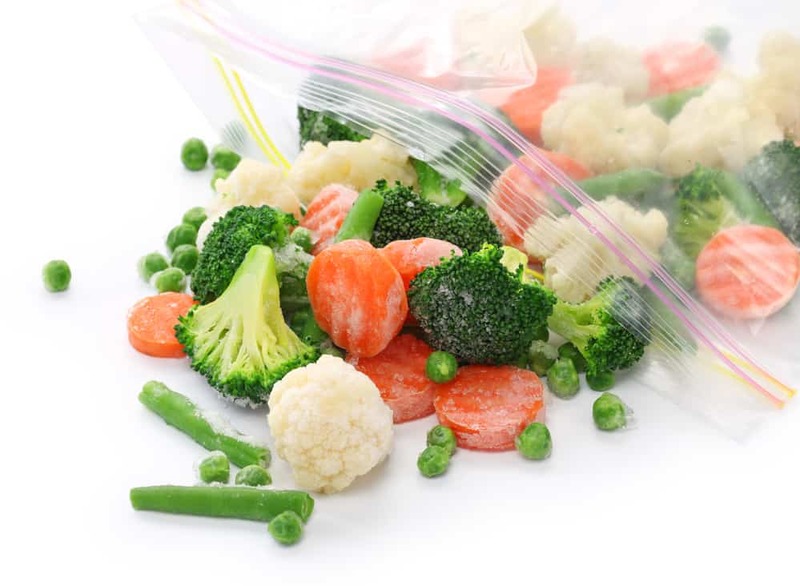 Many people don’t realize that it’s actually quite easy to freeze fresh vegetables and fruits. Be sure to blanch your veggies first by boiling them for a minute and then submerging them in ice water. This preserves the vegetable’s nutrients and helps it freeze better and last longer. You must dry all of your produce thoroughly before putting in your storage containers and squeeze as much air out as possible. 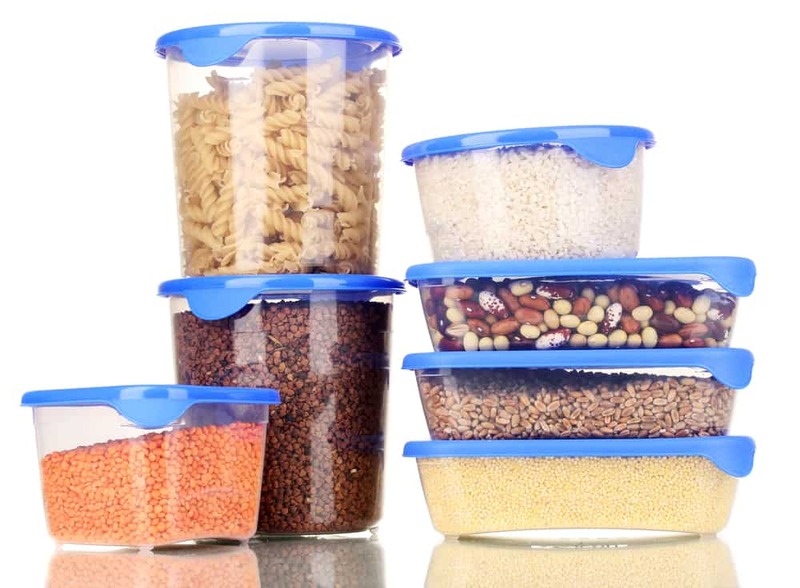 Make sure you date your containers, so you can use the oldest products first. Fruits usually stay good in the freezer for about a year, while veggies can last up to 18 months. Unlike many processed frozen foods, when it comes to fruits and vegetables, store-bought frozen products are usually just as good if not better than fresh. Companies generally pick the produce when it’s perfectly fresh and flash-freeze it, so you’re getting a quality product that lasts far longer than what you’ll find in the produce section. Keep an eye out for sales and stock up on frozen produce whenever you can. Pre-ground spices are usually less expensive at ethnic grocery stores, but you can save even more money if you purchase them whole and grind them yourself. You’ll also be getting a fresher and more aromatic product since spices start to degenerate the moment they are ground. You can go the old-fashioned route and use a mortar and pestle, purchase an inexpensive spice grinder, or even use your blender in a pinch. 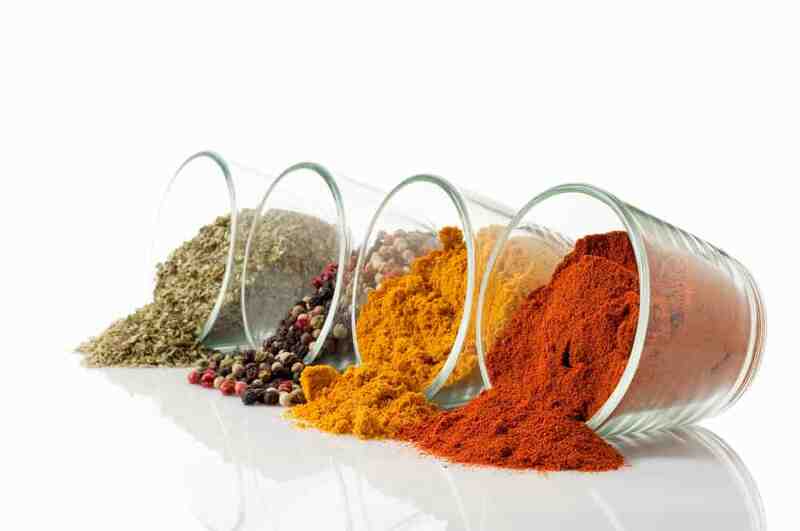 Asian and Indian markets are a great source for whole spices, as are some natural food stores. It’s easy and fun to make your own spice mixes. Start with simple ingredients, then experiment with making your own blends like taco seasoning, curry powder, and seasoning salt. Once you get the hang of it, the possibilities are virtually endless. While some condiments like catsup are fairly inexpensive, others can start to weigh down your grocery budget. Luckily, it’s easy to make homemade vegan condiments. As with most things homemade, they also usually taste far better than the store-bought versions. A fresh-made summer salsa can be the highlight of your meal. Some other delicious vegan condiment recipes that are easy to make include barbecue, teriyaki, or Thai peanut sauce. If you can stock up on tomatoes and basil on sale, you can also make a killer marinara sauce which you can jar and store for use throughout the winter months. You can make even the most boring dish delicious by adding the right flavorings. When writing out your vegan grocery list, think about adding a couple of high-quality oils and a few different kind of vinegar. Sesame oil is excellent on a variety of dishes including Asian foods, salads, stir-fried veggies and even French fries (well, maybe that’s just me). A good bottle of balsamic vinegar is delicious drizzled over green salads or even just over tomatoes. This is one area where you might want to splurge on the items you really love. Since the flavoring in these condiments is strong, a little bit goes a long way. It might cost you a little bit more on the front-end, but being able to jazz up even the most basic dish to give your meal a bang is definitely worth it. Pour on stir fried vegetables (use no more than half a teaspoon in the pan right at the end), mixed with lemon for dressing or with soy and pressed garlic for a dipping sauce for just about anything. Yes, it does sound posh and expensive, but tastes as if it has been drained from a ray of sunlight and will turn any tired leaf salad into food of the gods. Mix with olive oil and scoop up with bread ​ or use to marinate mushrooms overnight before grilling or frying the next day. This is a spicy, middle-eastern condiment that might not be to everyone’s taste. Frankly, you can get the some kind of heat from cayenne, but nothing comes close to the flavor. It can be used to spice up anything, but is amazing ​mixed with grated carrots, lemon, honey and cumin as a summer side or on grilled leeks or roasted potatoes. 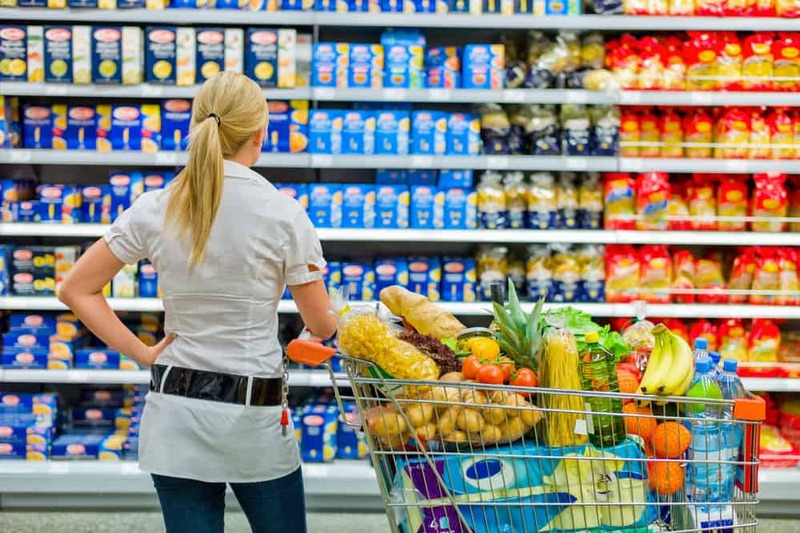 Before you head out to buy your groceries, it’s smart to take a look at weekly flyers or online ads to see which stores have the best prices on the items you need. If the sales are good enough, it’s sometimes worth it to visit several grocery stores in the same week to take advantage of the savings options. If shopping at a variety of grocery stores isn’t an option for you, either because you’re too busy or live in a rural area, try ordering some of your supplies online. You can often find specialty foods at retailers like Amazon for less than grocery-store prices with guaranteed two-day delivery. 9. 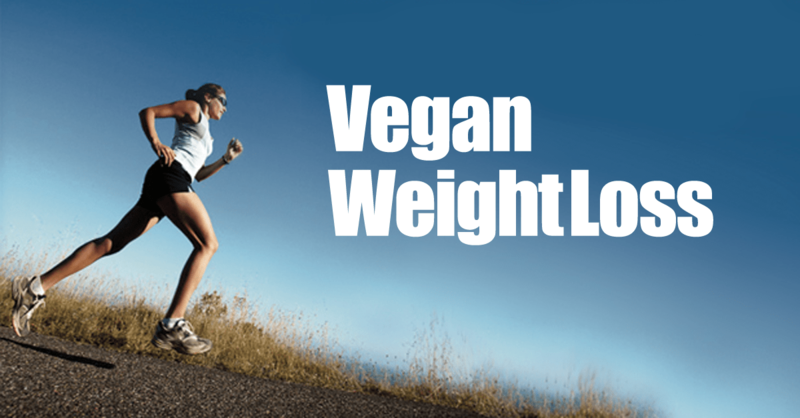 If it’s Branded “Vegan” – Beware! Interest in veganism is growing, and retailers are paying attention. Some companies are making a fortune by adding the word “vegan” to their packaging and then jacking up the price. You’re smarter than that! Take the time to familiarize yourself with the list of common animal products contained in processed foods. Once you have the list memorized, you can simply read product labels and choose any brand that doesn’t contain animal products. ​Not only will this keep you away from animal products, but you’ll be able to know what products are naturally vegan and having a vegan ‘stamp’ on it is there only to increase the price. This is a small step can save you some big money. Not only can eating leftovers save you money, it’s also a great way to make sure you have healthy foods available when you’re too busy or tired to cook a meal from scratch. When you’re making a recipe you know you like, think about doubling it and freezing the second portion. Remember that you don’t have to eat leftovers the very next day, and you can use leftovers from one meal to make a completely different entrée. Try to incorporate this into your weekly menu planning, and you’ll see how easy it can be. Also, don’t make the mistake of throwing away leftovers because you think there isn’t enough to make it worth saving. If you save a few bites from every meal, they can combine to make one more delicious meal that didn’t cost you anything. Canned beans are super convenient. They are also roughly twice as much as dried beans and take up three times as much space. So, as long as you plan ahead, have the right storage and have the extra cooking time, this is a great way to save money. It’s also better for the environment too and you aren’t getting any of that nasty BPA from cans. Remember that beans need to be soaked, either overnight or using a quick-soak method, and then usually take at least an hour to cook. Make your life easier by cooking a big batch and then freezing the leftovers. There are a few common staples that you either use every day or that have multiple uses. For example, coconut oil stores well and can be used for cooking, baking, and even for making DIY beauty products. As long as you’re able to store them properly, it’s smart to stock up on these items. Take advantage of sales and coupons to get the very best prices, and pick up as much as possible when the price is right. OK, for all you raw vegan out there, here are a few tips for you I’ve picked up from fellow vegans who have been through raw diets. For those unfamiliar with raw veganism, this is a growing trend that involves consuming only foods that have never been heated above a temperature of 115 degrees Fahrenheit. Some believe this is healthier for you, as certain enzymes and nutrients start to degrade at higher temperatures. Raw vegans primarily eat fruits and vegetables, sprouts, nuts, seeds, seaweeds, roots, fresh herbs, and spices. 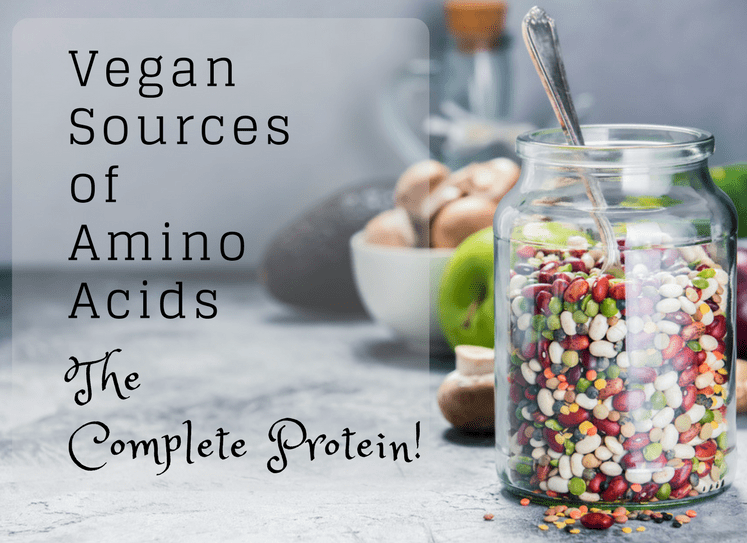 While a raw vegan diet may be healthier, it can also stretch your budget. 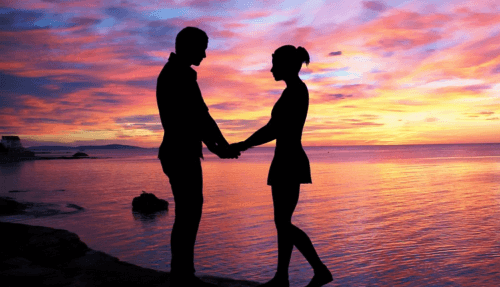 Here are a few tips to ease the pain. While we’ve already discussed the advantages of freezing fresh fruits and vegetables, this is even more important for raw vegans. Since all of the staples of your diet are inherently perishable, you need to be really smart with your grocery-buying plan. If you try to buy fresh all the time and toss items when they go bad, you’ll quickly go broke. If you’re not going to cook your vegetables after they thaw, preserving the flavor and texture becomes even more important. Tomatoes, onions, squash, corn, and leafy greens tend to freeze well. Try to avoid freezing vegetables with a high water content, like cucumbers. Eat your frozen vegetables as soon as possible after they defrost and consider blending them in a smoothie or cold soup to mask any potential mushiness. Flavorful dips and the right sweeteners can completely transform any raw meal. Stock up on some agave, molasses, maple syrup, date syrup, or yacon root syrup. These are excellent for adding a touch of sweetness to smoothies, salad dressings, or your morning tea. You can add a delicious kick to just about anything by keeping a couple of great salsa recipes on hand. Many savory dishes are excellent with a traditional spicy salsa and you can satisfy your sweet tooth in a healthy way by adding mango fruit salsa to your meals. You’ll also want to experiment with a few tasty salad dressings, peanut sauce, teriyaki sauce, and raw vegan versions of marinara sauce and mayonnaise. Decide which sauces you can make ahead of time and keep on hand to add extra flavor when needed. One of the keys to sticking with a raw vegan diet is knowing how to create meals with a variety of textures. Blending textures together keeps your taste buds happy and also helps you stay full longer. Try combining soft fruit with granola and crunchy flax seeds to create a delicious meal that will leave you feeling satisfied. Snap peas will give you a satisfying crunch and are excellent when dipped in raw vegan cheese or hummus dip. Once you get the hang of combining textures, you’ll start to see inspiration everywhere. The body handles raw foods best when you graze, rather than gobble. Skip the traditional 3-meal-a-day plan, and instead just eat snacks when you feel hungry. Not only will this aid in digestion and nutrient absorption, it can also keep your metabolism active, help you lose weight, and save you money. You’ll be less likely to waste food by having more leftovers than you can eat, and can enjoy a wider variety of foods throughout your day. OK, so I made a big claim about being able to eat as a vegan on a weekly budget of $25. If you’ve read my guide above, you can see it’s more than possible. You might even already be excited about actually doing it! The key principle is that you are not necessarily aiming for ​spending $25 in week 1. What you are looking to do is average $25 over time by spending the money up front on those things that you can buy in bulk (see Buy More, Spend Less above) and then combining those with what is on sale or going out of season and using or freezing so they last longer too. So maybe you will spend $30 or a bit more initially, but then less than $25 in the coming weeks. Will it get a little boring and repetitive? No, because you have your specialty condiments to jazz it up where you can and your fresh produce will change with the season. No, because you are shopping for categories not recipes: protein, vegetables, fruits and grains. Hell yes! And it’s vegan! OK, ​before you start to say that getting these prices are absolutely unrealistic or that there is no way you can feed yourself well on so little, ​let’s get a few things straight. Also, there are essentials I do not include which I am assuming you already have – sweeteners, seasonings, oils, etc. ​So how does this look in practice? ​And what can you cook up with these ingredients you ask, for such a paltry sum? ​​Plates full of healthy deliciousness​, is the answer. ​Strip away all the extras from many of my recipes​ and you will see the heart of any good vegan meal can be recreated on a budget. ​Try a fruit salads for breakfast with cinnamon or delicious home-made granola from oats, seeds and maple syrup​. For lunch, ​a chickpea “tuna” sandwich or these cauliflower gratin pots would hit the spot. ​Either this teriyaki tofu or scaled down version of a bean ​chili would be perfect for dinner and leftovers. 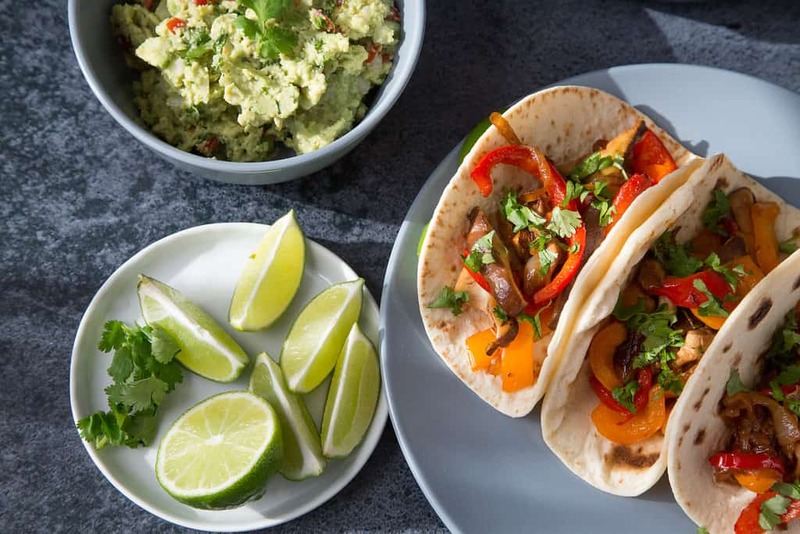 And whatever veggies you have left over as the weeks go on, keep a few tortillas ​handy to create a fajita. To save money on your groceries, aim to purchase foods that are as close as possible to their natural state. Processed foods like vegan cheese and veggie burgers should be used sparingly as they’re generally not great for your budget or your body. I hope you found this guide helpful! Do you have some vegan budget shopping tips to share? I would love to hear about them! Let me know in the comments below! If I try to pull up the meal plan…it shows up as spam. I decided at the age of 4 that I wanted to live this life. I’m extremely happy that my father decided to make a vegetarian dish for me every night following. “Ask store if they have overly ripe fruit you can buy at a discount” ?! Ugh. I would rather not. Dinner tonight: Baked tofu marinated in Paul Newman’s Oil & Vinegar Dressing. Steamed green beans with Earth Balance “Butter.” Simple, Easy and Cheap! Ricky DeBats it can be done! It’s a neat concept if you don’t have any time to cook more than once or shop around, but id go crazy eating the same ingredients over and over. My son and I spend $55 – $60 a month for the both of us on average and eat a bunch of different things as well as a few snacks. I wish I would have found this before o went grocery shopping yesterday! What good ideas. This would be great if one doesn’t care about eating GMO produce. I don’t know about any of you, but $25 doesn’t go very far in CA for organic produce. This is my budget!! I was right on…lol. (sometimes I go over) but this is totally doable peoples. I’m giving it a shot. I have been telling people this for years. No one ever seemed to really believe me. It is amazing how many people think eating Vegan is more expensive! Darby Crash this is a great site for grocery lists!!! Your stupid website has bad links to viruses. I’m unliking. Idiots. Both of the links are spam…….. I tried clicking the shopping list and the meal plan. I have three kids, but I manage to stay on a budget. I don’t buy it. It sounds great but that list (that I cannot open) may have been made when the cost of food was cheaper? I can’t open the links either, but I buy most of my produce from farmers markets and when I can’t, I buy from Aldi. I can’t always afford organic, but I can afford vegan! After the initial switch, it can be very cost effective. I did have to go out and buy some essentials in the beginning (coconut oil, ground flax seed, almond meal, chickpea flour, chia seeds, vegan protein powder, agave nectar, etc.) and it was a pretty big bill to start. However, now it’s pretty inexpensive. We do A LOT of bean meals (which are all fab, btw) and beans are mega cheap. Bulk whole grains are inexpensive, too. We love it! Thank you for this! Just the jump start I needed to change my eating habits!! I became vegetarian a year ago and now i’m working towards vegan and i’m really struggling financially with it. I need as much advice as i can get. It’s like the same food everyday. No thanks. I thought this article was a good one. I personally love reading anything frugal (we are a 1 income household) so tips and basic meal plans are always super helpful! I’m vegan and for over a year I only had $50 per paycheck for food and I was always full and had really yummy good meals. My fav meal is a rice bowl with mixed veggies and sweet potatoes and salsa sometimes I’d even have baked seasoned tofu too ?????? It’s a lot more expensive in Alaska for food unfortunately ? Can anyone recommend some good vegan pasta brands? (Aren’t regular pastas made with milk and eggs?) [bonus points if they’re the flavored kind like the tri colored ones] it’s easier for me to go on a brands website and search for stores that sell them instead of running all over town looking and hoping a store has a “vegan” option for products. Thanks! Unless you have an omnivore bf who loves your vegan cooking so much, that you’re spending $100/week on groceries :/ plus it’s La Jolla in San Diego, and we normally buy organic/non GMO/vegan-friendly, etc. foods! 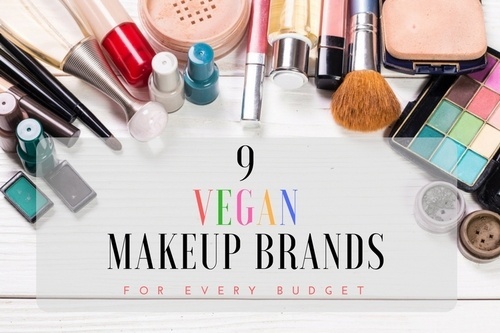 Nine Fantastic Vegan Make-Up Brands For Every Budget!